Fern Hollow: Birdsmouth Part 2 - Gluing it Up. 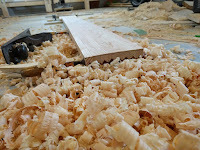 Late last week I was marking out the taper on the staves for the top of the mast where it reduces from 90mm to 50mm and I happened to check my email and found that another Campion Apple builder had seen my last post where I had assembled the roughed out staves and was about to cut the tapers. 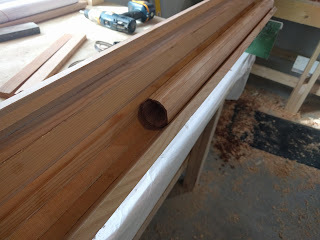 He suggested that I don't start the taper so low on the mast 1450mm from top; instead, I should just taper the area above where the yard connects at about 200mm from the top. 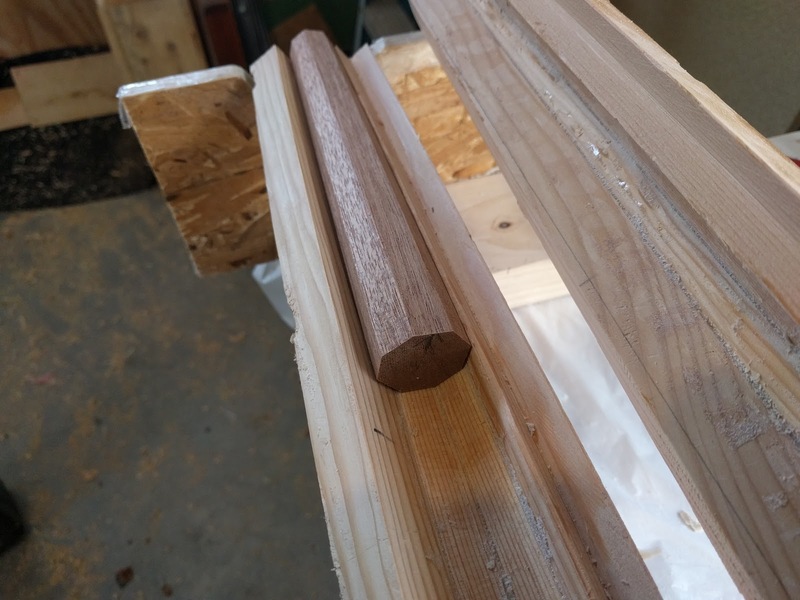 He said that I should go with a stiffer spar, so I adjusted the taper to go from 90mm diamter at 1450mm from the top to about 70mm about 200mm from the top and do the last 20mm taper (to 50mm) in the final 200mm from the top. I probably didn't explain that very well, but to make a long story short, I did a more gradual taper until the last 200mm and then got it down to 50mm much faster. To actually get it done, I ganged up all staves, laid them out on the floor and clamped them together. 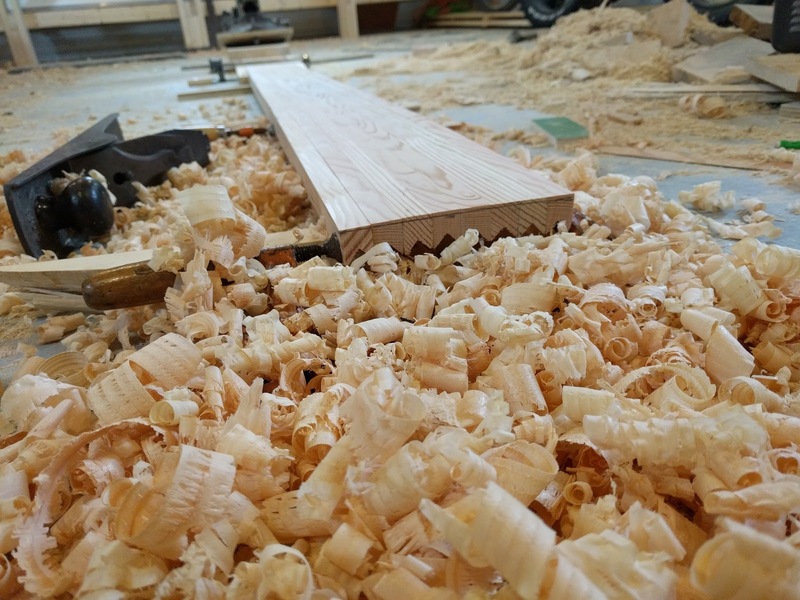 Then I took my 22" bench plane and set to work on the gradual section before finishing off the steeper taper with a jack plane. 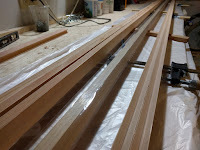 Once I was satisfied, I cut out a second, smaller set of staves ~1 meter long that I will use for the bottom plug (the designer calls for a solid mast for the bottom 1 meter with no hard transitions. 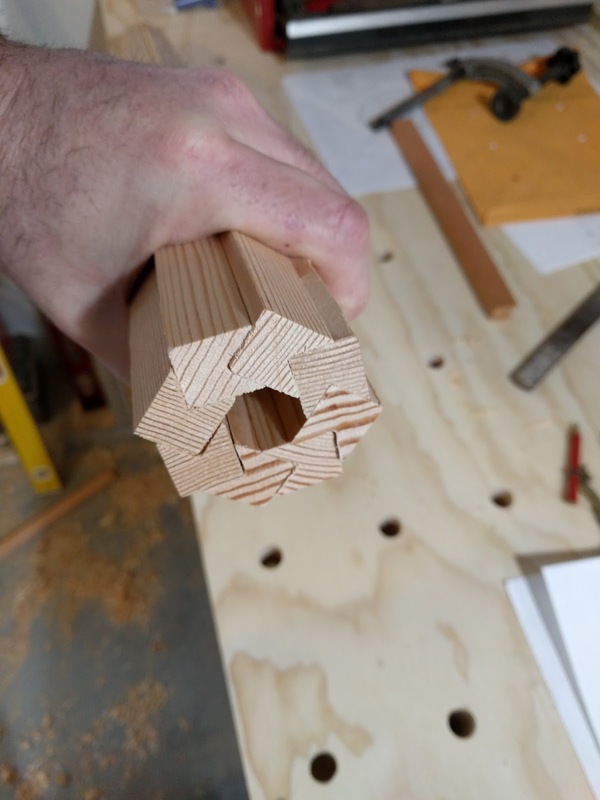 To do that, I had to to cut the top ends of the staves so that their thickness tapered from very thin to regular thickness along the top 200 mm. I managed to get it close to correct on the first try, but I will have to thin the top a bit more with a rasp before I install it. 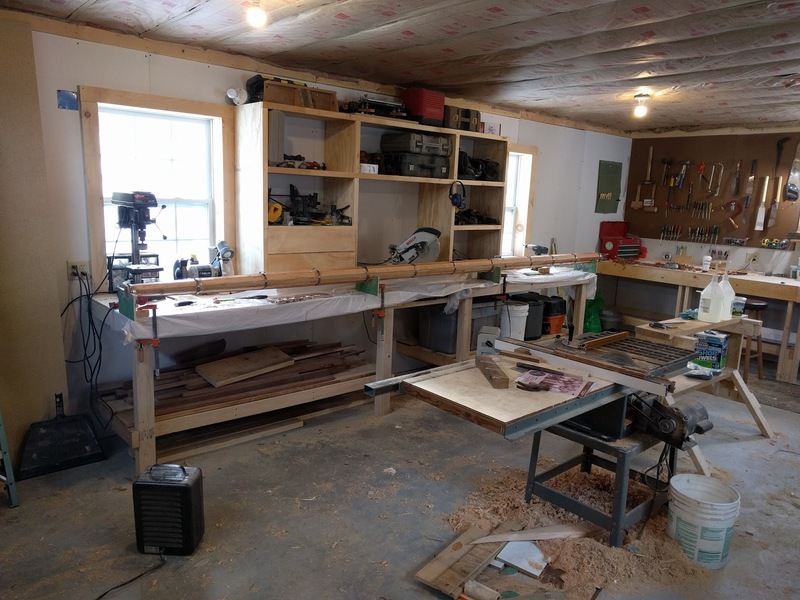 In the comfort of my warm basement at the house, I glued up the plug and had to wait out a particularly cold spell that I knew would prevent me from getting my shop above 50 degrees F (minimum glue up temp). 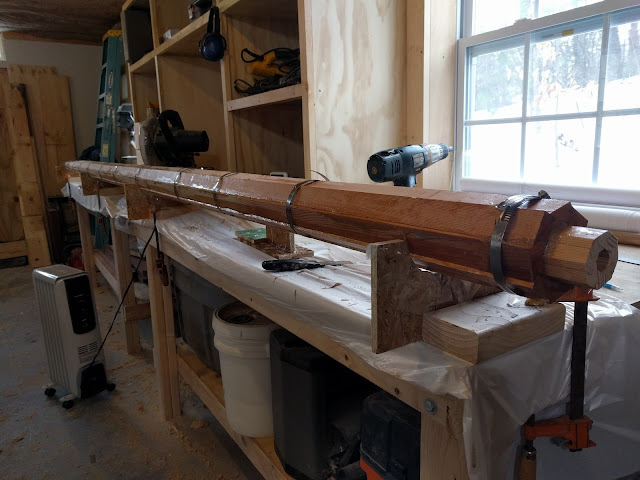 I just don't have the room in the basement to glue up a 15 foot mast. This weekend I scrounged up a third space heater and tested it out with the other two and was able to keep the temp in the shop up around 60 F even though temps were roughly 12 F. I decided it was time to get it done and glue it all up; sort of. My plan was to glue everything up except for staves 1 and 5 (I put packing tape on the square sides) so I could split the mast apart once it was mostly glued up. I enlisted the help of my wife and son to hold various sticky pieces while we wet them out and got them into position. 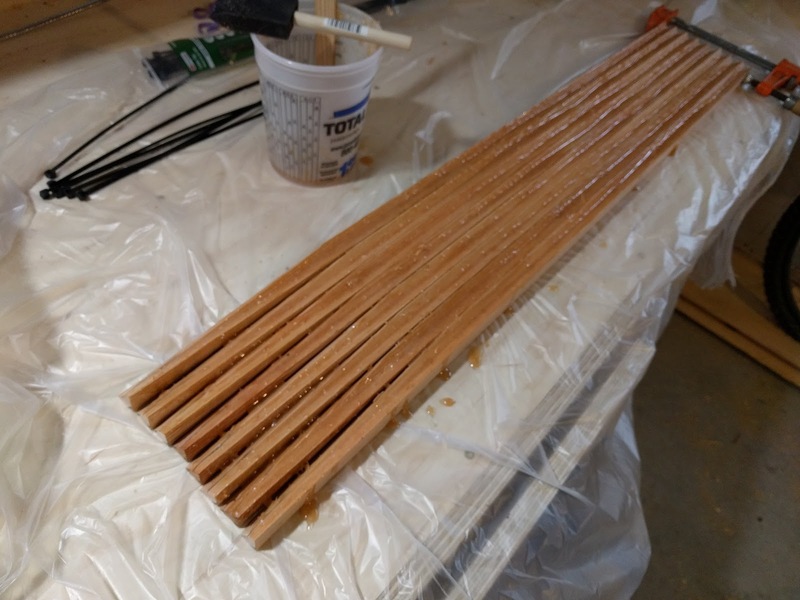 To make a long story short, it all went well and we got all the staves into place and then I hosed clamped them tight to cure for the night after using 24 ounces of epoxy. This morning I got up early and was happy to find the shop warm and the epoxy nice and hard. I split the halves apart and pulled the packing tape off each side so I wouldn't forget later and then spent some time with a heat gun cleaning up some of the inside drips at the top and bottom of the mast where the plugs would go. 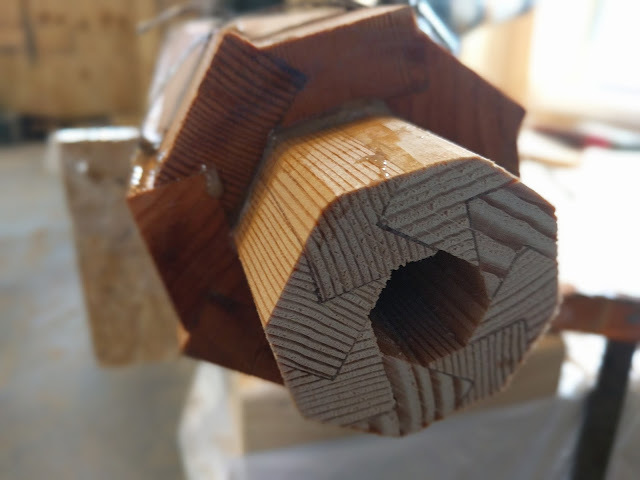 Since I already did a lot of prep work on the bottom plug, I was able to adjust and fit it snug in short order and then rasped out the tapered end to ease the transition from hollow to more solid. For the bottom plug I found a nice piece of Honduras Mahogany that was a cockpit deck beam on my Alberg 35 in a former life. When I rebuilt the cockpit in that boat, I couldn't bring myself to throw away those perfectly good and really lovely wood even though the rest of the cockpit was a soggy mess. I'm glad I didn't, because it was just a dream to shape down into a 200mm cone for the top plug. 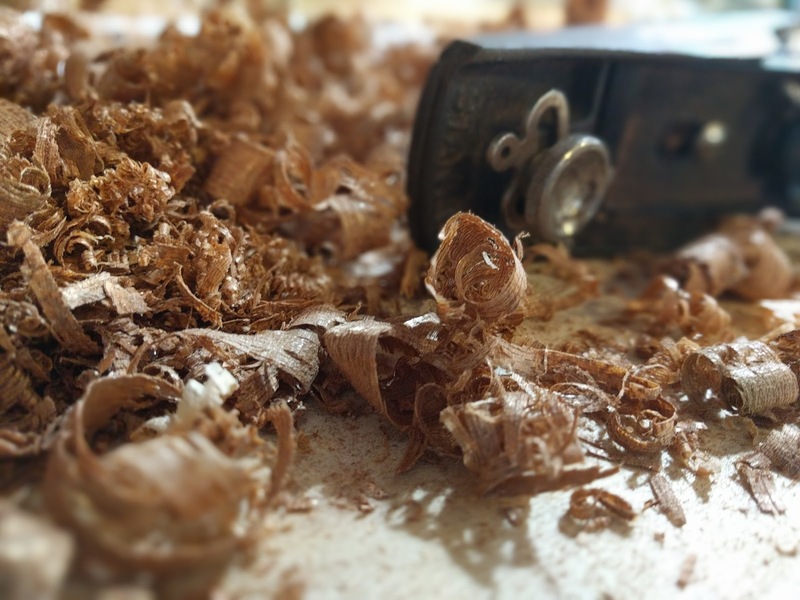 The perfect grain allowed my block plane to shave off delightful and very satisfying curls of wood. Once the top plug was fitted, it was time to epoxy it all back together again. This time I didn't have any help, but didn't think it would be a big deal to do it myself. It ended up getting a bit hairy because I miscalculated how much epoxy I would need to get the plugs set and ended up doing 3 - 9 ounce batches. By the time I got finished spreading out the last batch, the first batch was pretty close to kicking, so I got it all clamped up as fast as possible. It was just in the nick of time because when I was cleaning up the squeeze out a few minutes later, I could feel the excess staring to get that weird coagulated state consistency that epoxy gets when the reaction gets going. I went over to the shop and checked on it a few times tonight and on my last visit I was pleased to find very little tackiness left so I'll be able to pull the clamps off tomorrow and starting cleaning it up.